The are many areas of the world where church members don't have church service in a regular church building. Many gather in small groups at other members' homes because they don't have their own church building. Groups in these areas tend to grow very quickly and outgrow their current location, so they have to relocate. The problem is that every time a church relocates, you usually "lose about 30 percent of the original membership. "¹ So how do we fix this problem? Maranatha and ASI² have come up with a solution: the "One-Day Chruch." Amazing video. How much more must God love you and me! Video is based on an award-winning Czech short film called "Most." 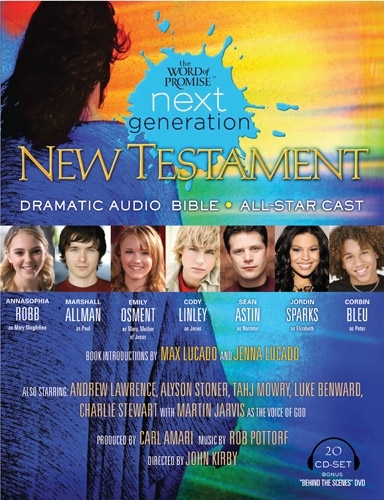 Some of the actors include Cody Linley (Hannah Montana, Dancing with the Stars) who plays Jesus, Jordin Sparks (American Idol 2007 winner) provides the voice of Elizabeth, Corbin Bleu (High School Musical) plays Peter, Emily Osment (Hannah Montana, Spy Kids) acts as Mary, the mother of Jesus, and Alyson Stoner (Cheaper by the Dozen, Camp Rock) plays Martha. Of course, more celebrities are involved in the production than those mentioned above. Dr. Wintley Phipps is a pastor at Palm Bay Seventh-day Adventist Church in Palm Bay, Florida. He is the founder of the US Dream Academy, Songs of Freedom Publishing Company, and Coral Records Recording Company. Dr. Phipps is also an internationally known speaker and performer. He has sang for 5 United States Presidents, Mother Tereasa, Nelson Mandela, and has conducted lectures in Africa, Asia, North and South America, Austrailia, and Europe. He has appeared on the Oprah Winfrey Show, Saturday Night Live, and Billy Graham Crusades. To learn more about Wintley Phipps and how he tells people about Jesus, click here. You can also learn more about the hymn, "Amazing Grace," by clicking here.